My take: I am so looking forward to the film based on this book! Gordon wrote the novel as a modern-day epistolary; a series of (incredibly long and well-written) emails to 17 year old Isabel, mostly from her father, Jim Grant, an ex-Weatherman living as a civil rights lawyer, as he desperately tries to clear his name from a murder charge stemming from his past acts. Ironic as he has gone through several names throughout his life. Others - friends, former lovers, a young newspaperman and various key figures in Grant's history - send these (incredibly long and well-written) emails to Isabel, Iz, Izzy, as well, which briefly gave me pause. Once I got over the fact that most people just don't write (incredibly long and well-written) emails, I relaxed and enjoyed the intense narrative and found that I was caught up with each character's carefully-crafted version of events. The email format is an interesting device which serves to connect these stories and figures from the 'revolutionary' past with the present day; still they are the longest (incredibly well-written) emails you will ever read! Gordon has skillfully given each character their own voice with Isabel's daddy's voice, being the strongest and along with Mimi's, his onetime revolutionary partner and lover, the most telling. The love he has for his daughter is beautifully drawn even as he runs from her, seeming to abandon her. Mimi, with her taste for 'the gutter' - really just another word for freedom - tells a story which takes us all over the country by land and by sea, including the California coast, Miami, Ann Arbor, Michigan, the Catskills, giving us a highly detailed, almost procedural look at living 'underground'. The minutiae of losing a tail, living off the land, creating identity after identity and living that way, ever on the alert, for years and years; all of it had me spellbound. The other powerful voice is that of Ben, the young journalist trying to crack the case. His version of events comes with a subplot that I found slightly far-fetched but I enjoyed that side of the story so much, I decided to buy it anyway. For readers of my generation especially, (boomer, baby!) the look back is thrilling but also poignant. Seeing sixties activists in the rear view mirror made me a little sad to remember all the sacrifices made, both wisely and stupidly, in the march for progress, peace and justice for all. Recalling the nightly parade of violence on the TV news; the horrific stories coming out of Viet Nam, the student protests, the race riots, the vitriolic hatred between the left and the far right, the divisions all Americans saw and felt no matter which side one was on, I can't help but stop and wonder at how the world has changed since then, and how it hasn't. It is indeed a book that made me think and reflect. I also chewed some nails (my own) along the way. The Company You Keep by Neil Gordon is a superb political thriller with a wonderful soft underbelly of love, loyalty and the deepest ties of all, family. It's a much faster read than its' length and complexity would have you think. The book is available on the Nook; I saved a buck or two or fourteen and borrowed it from my local library. As always when I've read a book knowing it's bound for screendom, my reading was colored by my knowledge of who was playing who; Redford as the main character - a civil rights lawyer with a very hidden extreme leftist past - seems perfect when I consider Redford's personal politics which is what probably attracted him to directing the adaptation of Gordon's novel in the first place. That being said, I admit to being confused about how the story will be told on film - Redford is fine (although technically a tad too old) for Grant in 2006 but how are the long looks back at the past we see in the novel handled? I found myself asking again and again; who is going to play the young revolutionaries as we see them in the book, carrying out their revolutionary plans, and falling in love? I can't get any satisfaction on imdb as I look for clues so my hunch is that the screen story has seen a radical re-write from the novel. Judging from the trailer, which gives us barely a glimpse of Mimi played by Julie Christie, the films' focus seems to be the tension and excitement inherent in the current day manhunt vs the more nostalgic moments of the characters' youthful pasts. Speaking of youths, Jackie Evancho, plays Redford's daughter. She's the singing prodigy with the God-given voice that earned her the win on America's Got Talent . Shia La Beouf is the reporter; a smart choice for the ambitious young Ben so easily distracted by lust/love. 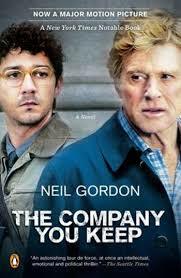 The movie, The Company You Keep opens one week from tomorrow on Friday, April 5th. Watch the trailer... What do you think? 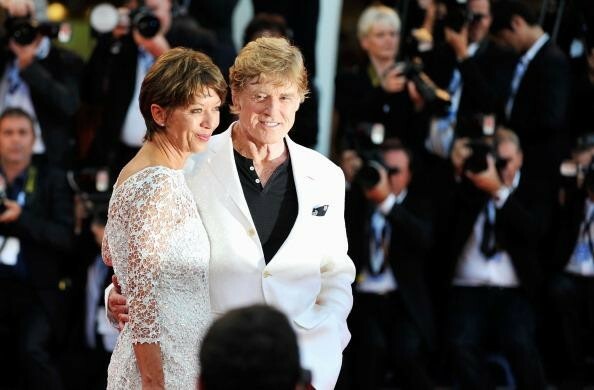 How can Robert Redford still look so good? I can picture him as a father of a little girl. After all, Tony Randall became a father at 80 or something. I noticed this post when I was visiting your Saturday Snapshot post. I was hoping to see it this weekend but MLH hasn't finished the book yet; grrr.